It was their 50th wedding anniversary. After all the guests and family had left and the house was empty again Gertrude turned to Henry. We need reminders. It’s not that we forget, but little things: misunderstood words, half heard comments, the look that meant something else, and soon we begin to wonder if we are still loved. So we need reminders- many and often- lest we descend into a pit of doubt and despair. One reminder I have on my desk looks like wood but it feels like a rock. It is both. 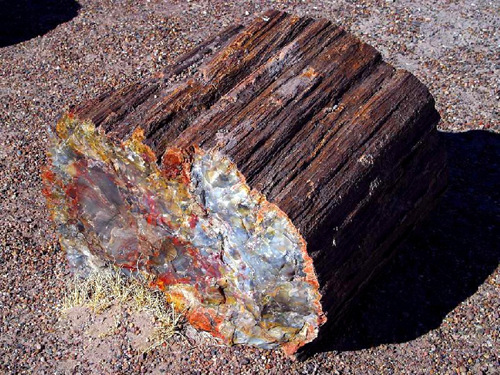 Over 225 million years ago a tree fell. It was covered with sand and mud. Over time, as water seeped in, the minerals in the mud and sand replaced the wood and it became a rock. It still looks like wood. When I look at it I am reminded that when God’s Spirit lives inside us and we turn our lives over to Him, He replaces us! Some days you may feel more like wood, others more like rock. As we let God change us from the inside out some days we are more aware of our godliness and on others more aware of our humanity. But every time you catch a glimpse of God in yourself or anothers, rejoice!